Five Rot-Weiss Koln players have been named in the German World Cup squad named on Monday as the big event in India comes sharply into focus. Mats and Tom Grambusch, Johannes Grosse, Marco Miltkau and Christopher Ruhr have all been named in a high quality panel who feature in one of the toughest initial groups, playing the Netherlands, Pakistan and Malaysia. Stefan Kermas’s side has a large number of players set to play in the EHL next Easter with Uhlenhorst Mulheim trio Benedict Furk, Timm Herzbruch Ferdinand Weinke and Lukas Windfeder joined by Mannheimer HC’s Danny Nguyen Luong and Dragons’ Tobias Walter. Nine Olympic bronze medal winners of Rio 2016 are still in the World Cup squad of Stefan Kermas, which contains a balanced mix of experience and talent. With Fürk, Martin Häner and Tobias Hauke, three players have already passed the 30. Herzbruch and Große are the youngest in their squad at the age of 21. Uhlenhorst’s Julius Meyer and Hamburger Polo Club’s Constantin Staib have been named as reserves and will travel with the team in case of injury or illness. Prior to their departure on November 24, Germany will play three games in Alicante as part of their warm-up preparations. LAHORE: In a potentially alarming development for the national game already facing multiple crises, Pakistan Hockey Federation secretary Shahbaz Ahmed Senior on Monday feared that if the government does not release the grant of Rs80 million for the federation within a week, it will be tough for the PHF to field national team in the World Cup starting later this month. “The PHF has directly written a letter to the Prime Minister Secretariat for the release of Rs80 million grant as the World Cup is around the corner. And if Pakistan does not succeed in fielding its team in the World Cup it will defame the country’s name and [as a result] its massive damage will also be felt by our hockey in future too,” Shahbaz told reporters ahead of the national training camp that starts here on Tuesday. “Pakistan can face a heavy fine from the International Hockey Federation (FIH) for not fielding a team in the World Cup, for any reason,” he warned. Responding to a question, Shahbaz said though the PHF was in contact with the Ministry of Inter-provincial Coordination, a direct letter had been written to the PM Secretariat to get the said grant at the earliest as time was running out. Moreover, Shahbaz added, the PHF was also trying to get some sponsorship from the private sector to address the financial crisis. To a question, he said the PHF would soon announce the hiring of Tauqir Dar and Danish Kaleem for the national team management. “As I have just returned from India [after attending the FIH Congress], I will meet the PHF president to get the approval for the hiring of these two Olympians,” he said. “Tauqir has been serving hockey by running Dar Academy while Danish is serving there as coach. Both are involved in hockey activities, so they can be the best choices,” Shahbaz reckoned. He said a three-member committee would be formed soon to probe the spat occurred between head coach Hasan Sardar and then-assistant coach Mohammad Saqlain during the recently-held Asian Champions Trophy in Muscat. As a result of the unfortunate incident, Saqlain had to quit the post during the championship. “Hasan as team head coach and manager has vast powers as he is responsible for every result. Therefore, he should have like-minded persons in the team management,” Shahbaz maintained. It may be mentioned that Hasan recommended the name of Tauqir as head coach but the latter had refused to work on this post. However, he agreed to join the team as assistant manager. Tauqir, on his part, had recommended the name of Danish for the position of assistant coach in place of Saqlain. During the FIH meeting in India, Shahbaz said, he held a joint meeting with the officials of FIH, Bangladesh, Kazakhstan and Afghanistan on organising an international tournament in Pakistan next month. “All the participating countries have promised to inform about their availability for the said tournament in a week’s time,” the PHF secretary said. Meanwhile, Shahbaz expressed the determination to make an all-out effort to hold the Pakistan Hockey League (PHL) within the next two months. “I believe we will have to hold our league on priority basis. This is necessary for the development and growth of our young players,” Shahbaz said. “The successful holding of the league will pave the way for Pakistan to regain glory in the national game. “I believe I am in a better position now to invite international players for our [planned] league. I’m sure I will manage to convince world’s renowned players to come to Pakistan for this league,” he vowed. Amid tense bilateral ties, Pakistan’s hockey team is awaiting visa clearances from India to travel to Bhubaneswar later this month for the World Cup. Sources told The Tribune that the team is ‘likely to travel’ to participate in the multilateral event and there is ‘no problem in principle’. The tournament, which will see 16 teams face off, kickstarts on November 28. The teams are expected to start reaching Odisha a week prior to it. “The visa applications are under process. The tournament begins end of November. We have enough time,” stressed a source. Sporting engagements between India and Pakistan have been minimal even as a Parliamentary Standing Committee on External Affairs, that was briefed by Foreign Secretary Vijay Gokhale last month, advocated some form of ties including people to people and sports. However, unlike in 2016, when the Pakistani team applied for visas after the official deadline and later withdrew from Junior Hockey World Cup held in India, this time visa requests were received in time, the sources said. “There is no delay in issuance of visas. Pakistan has sent a long list of 30 members. It has to be cut short to 20 by November 10. Once that is done, they will be provided with visas to travel,” said a Hockey India official. The official also clarified that the Indian team too will have to be pruned to 20 by the November 10 November deadline. 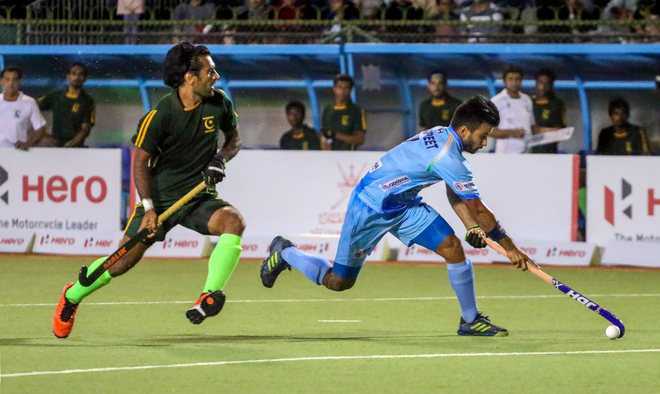 The International Hockey Federation (FIH) has requested the Indian government to allow Pakistan to participate in the top tournament. A three-member Pakistani delegation was in attendance for the FIH Congress in New Delhi last week. Pakistan’s hockey team last played in India in December 2014. In the past few months, India has been accused of denying visas to some Pakistani academics, scholars and chefs who wanted to travel for conferences and a Food Festival in Amritsar. India in September called off a Foreign Minister Level meeting scheduled in New York within twenty four hours of accepting the Pakistani offer of talks, citing spate of killings in Kashmir among its reasons. “Let me tell you that the visa regime between two countries is a reflection of the current state of relations between the two countries. And if the relations are not good then it is understood that visa regime would not be good,” MEA spokesperson Raveesh Kumar responded last week to a question on whether visas will be issued to Pakistani exhibitors to participate in the upcoming India International Trade Fair. 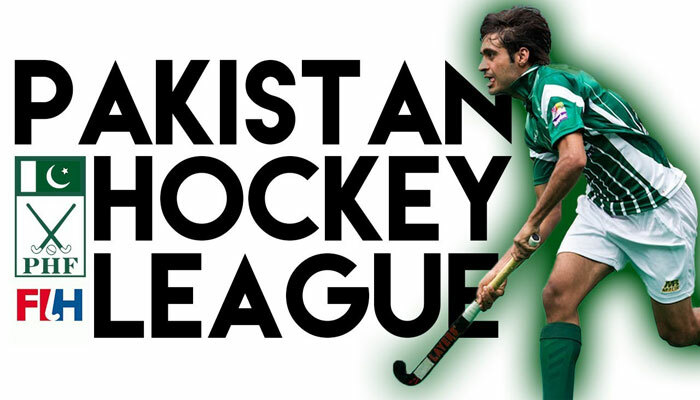 ISLAMABAD: Secretary Pakistan Hockey Federation, Shahbaz Ahmed Senior on Monday expressed the determination to make an all-out effort to hold Pakistan Hockey League within next two months. “I believe we will have to hold our league on priority basis. This is necessary for the development and growth of our young players” Shahbaz told APP on his return from India after attending a meeting of the International Hockey Federation (FIH) in New Delhi, where he was also elected as a member of Board of Governors of world game’s governing body. Shahbaz said that the successful holding of the league would help pave way for Pakistan regain erstwhile glory in the national game. “I believe I am in a better position now to invite international players for the league. I’m sure I will manage to convince world’s renowned hockey players to come in Pakistan for the league,” he said. Shahbaz, however, said that the federation would need Pakistan Sports Board and the government’s backing to arrange the prestigious event in the country. “We are looking forward to the PSB and government to hold the mega event. Our youngsters need exposure and the league will provide a perfect platform to them. “They will get inspired and motivated. They will develop the passion for the game when they will see world’s top players performing right in front of them,” he maintained. Shahbaz said it was unfortunate that youngsters in the country were losing interest in national game and the result was that Pakistan had stopped producing great hockey players. He also underlined the need to establish hockey academies and training centres in various cities of the country to revive the national game. “Sooner or later, we’ll have to invest to set up training centres and academies to polish the skills of our promising players,” he added. He said it was necessary to develop sustained passion for hockey among the youngsters. “This is only possible if we’ll introduce the game at gross-root level by establishing hockey academies,” he added. The Hockey India League looks set to return in 2019 featuring men’s and women’s teams and a shortened format. According to a Hockey India official, HIL is slated for after the completion of the FIH Pro League, between November and December, and will played under five-a-side rules. The franchise teams will remain the same, although Delhi Waveriders, which featured the like of England’s Iain Lewers, are not expected to take part. “The league would be remodelled and would now include both men’s and women’s events. We are looking at making it 5-a-side instead of 11-a-side,” an official told reporters. Each franchise will have 10 men and 10 women in their squad, it is reported. “The existing franchises are likely to continue and we are still in talks with them, working out details. We are also talking to other possible owners,” the official said. India’s growing success has previously been credited to the success of the HIL in enabling young players to play alongside the top stars. It is not known how many international players will be retained by each franchise. With the Pro League stretching from January to June, clubs may have the final say on any foreign players being enticed to India. English Conference side Old Georgians have scored another significant coup after they announced the services of Ashley Jackson on Monday night. Jackson, 31, is currently knocking in the goals for his Dutch side HGC, but the Hoofdklasse winter break has allowed the Weybridge-based club to sign Great Britain’s all-time leading scorer. Jackson has clearly got his hockey mojo back up and running. With 12 goals in 11 games and leading the Hoofdklasse goalscoring tables, Jackson will now look to keep Old Georgians top of the Conference East table. “Having witnessed Ashley first hand as a youngster playing against us for East Grinstead, it will be a pleasure to have him on our side,” a club statement read. The Surrey side, founded only in 1995, are unbeaten after six games, with current England forward Sam Ward also playing for the club, which also features the likes of Dan Fox, Dan Shingles and James Tindall. The Hockey Paper reported last month that GB coach Danny Kerry had made contact with Jackson to seek his views on a possible return to the international set up. For that to happen, Jackson would have to return full-time to the UK. His signing for Old Georgians could be the first step in realising a path towards Tokyo 2020. Old Georgians are at home to Cambridge City this Sunday. Loreto moved top of the women’s EY Hockey League with a 2-0 win in Belfast over Pegasus, moving above the Ulster side on goal difference. Corner goals in the first and last quarters from World Cup stars proved the difference with Hannah Matthews netting early on before Ali Meeke sealed the deal with 10 minutes to go. It lifts Loreto to 12 points, level with Pegs but ahead of on goal difference after five rounds of matches. UCD are in third but were forced to battle all the way by Belfast Harlequins in a 1-1 draw. The visitors to Belfield led in the second quarter when Jenna Watt was impeded, giving Zoe Wilson the chance to open the scoring from the penalty spot. Ellen Curran equalised in the second half from an excellent move down the right wing to draw things level before sides had big chances to win it before honours were shared. Pembroke continued their fine run of form with a third successive win, beating Muckross 2-1 in the Dublin 4 derby. Sophie Barnwell’s deflection had Muckross one up in the second half but another pair of World Cup stars, Emily Beatty and Gillian Pinder, turned things Pembroke’s way. Old Alex are another side on form. They scored twice early on in their 2-1 win over Ards, building a 2-0 lead by the tenth minute via Aine Connery and Hannah McDermott. Caroline Adams did score Ards first goal of the season from a corner in the second quarter but Alex remained in front for a third win since promotion. Cork Harlequins got their second win of the campaign when they beat Railway Union 3-1 at Park Avenue with Cliodhna Sargent in sparkling form. She set up Jane Murphy for a 1-0 lead they held for a long time until Sarah Hawkshaw equalised. But two goals in the last quarter from Michelle Barry won the day for the Cork side. In EYHL2, Queen’s lead the way in Pool 1 thanks to a third win, beating Trinity 3-2. UCC got their first win as they dismissed Greenfield 4-1. In Pool 2, Monkstown and Catholic Institute advanced their perfect records. Town won their third match with a 5-1 win at Dungannon while Insta beat NUIG 3-1 in Galway. Cork Harlequins picked up their second win of the season with a 3-1 win over Railway Union as Michelle Barry struck twice while Cliodhna Sargent put in an imperious performance in midfield. The first quarter ended scoreless with Quins having three corner chances while an excellent Barry run and slip pass ended with a miscontrol when well placed. The Cork side went in front in the second period when Sargent robbed Kate Lloyd in midfield and drove forward into the circle where she turned and delivered the perfect ball for Jane Murphy to turn in. Railway came more into the tie in the third quarter and they had their best chance when a speculative ball found Lloyd free on the left. Her reverse flashed across the face of goal. The Sandymount side – who were without Holly Jenkinson, Amy Elliott and Anna May Whelan – were back in from a penalty corner which saw an initial Hannah de Burgh Whyte shot saved but Sarah Hawkshaw picked the ball up and managed to squeeze home her shot at the near post. Quins got back in front when Olivia Roycroft chased a speculative Sargent ball into the corner, robbing the ball off de Burgh Whyte and crossing for Barry. With her first touch, she rounded Carolyn Crampton and stuck it in. Barry then made it 3-1 when she intercepted a long ball, danced into the circle and scored on her reverse. Both sides had serious claims for all three points but ended up sharing a cracker of a tie at Belfield 1-1. The visitors hit the front in the second quarter when Zoe Wilson launched a long ball over everyone to Jenna Watt at the far end who was through on goal. Her shot was impeded when shooting, rightly leading to a stroke which Wilson slotted. UCD struggled to find too much forward momentum in the first half as Quins worked well around a solid core down the centre of the pitch with a direct game when in possession. The students, though, found much more width with quick, in-to-out passes in the second half and it yielded plenty of dividends. Marianne Fox, though, was inspired between the Quins posts, keeping out numerous openings. Bethany Barr’s excellent pass into Niamh Carey’s run down the right finally unlocked the door when she crossed for Ellen Curran whose shot went in via a defensive foot. The final quarter swung end to end with Belfast having two major chances to nick it in the final minutes. Clodagh Cassin got down to deny Lucy Geddes at close range with a super glove stop and clearance. Then Wilson clattered the crossbar in the last two minutes. UCD, though, also had a massive chance on the final whistle with two corner shots, the latter of which Fox just about scrambled over the endline from Anna Richardson’s reverse. Pembroke made it three wins in a row as they came back from a goal down to beat Muckross in a highly entertaining Dublin 4 derby at Serpentine Avenue. While they had the best of the exchanges, Muckross carried a big threat at all times which they showed in the 13th minute when Sophie Barnwell’s deflection hit the post. Lisa Mulcahy’s power-slap was then saved off the line by Hayley O”Donnell. At the far end, Laura Noble’s touch came back off the inside of the post to somehow keep the scoreboard blank. The Muckross goal again led a charmed life when Aisling Naughton laid on a beautifully weighted pass – allowing time for the passer to stand back and watch it reach its target – to Gillian Pinder to race through one-on-one. She could have shot herself but her pass to the right post gave Ellie McLoughlin time to get across and smother. A corner did follow from which O’Donnell smashed off the base of the post. McLoughlin kept out Pinder on the hooter to keep it 0-0. The second half saw the goals arrive. Muckross got the first when a corner shot got a heavy touch down the left channel from Barnwell, seeing the ball bounce down and then loop into the net. The lead lasted five minutes when Pinder got a shot off which McLoughlin saved but Emily Beatty slung out a stick to the loose ball, popping in the rebound. And the winner came from the spot with 13 minutes to go when another O’Donnell corner slap was half-stopped before bumping into post-woman Julie Poland’s foot. Pinder slotted into the right corner. From there, Pembroke closed out the game well, stifling any Muckross openings and looking the more likely to score. Old Alex continued their fine start to the competition with a 2-1 win at Londonderry Park, moving them into fourth place in the table after five matches. Like each of their other wins, they got on the score sheet very early on as Aine Connery and Hannah McDermott struck within the first 11 minutes to set them on their way. Caroline Adams got one back from a corner in the second quarter and they had a good amount of pressure in the second but Alex secured the spoils as their enjoyable start to life in the national stage rolls on. Loreto got the big win of the weekend as they ended Pegasus’s perfect start to the season with a 2-0 win at Queen’s with a corner goal in the first and fourth quarters from World Cup stars. Hannah Matthews got the first in the ninth minute from a set piece and they remained ahead through a tempestuous second period in which both Alex Speers and Shirley McCay both spent time in the sin bin. The game was put to bed in the final quarter from another corner, this time Ali Meeke scoring the goal with 10 minutes to go. The win puts Loreto ahead of Pegasus on goal difference with four wins out of five. Insta won 3-1 in Dangan to record their second win of the group. Roisin Upton’s drag in the fourth minute got them on the board. Rachel Heskin tied the game up at 1-1 before Christine O’Shea restored the Limerick side’s lead in the 14th minute and Emer Ryan advanced it to 3-1 at half-time, the ultimate final score. It has created a five-point gap between the top two and the chasers at this early stage of the competition. 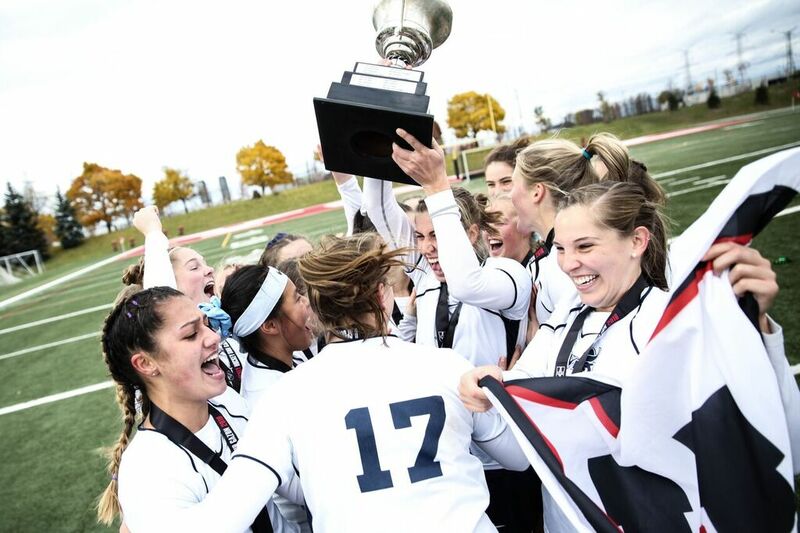 The Victoria Vikes topped the host York Lions by a score of 3-1 in Game 2 of the U SPORTS Field Hockey Championships in Canada on Saturday afternoon to bring home the program’s first national banner since 2008. Mason scored in the Terps' blowout semifinal win. When Maryland field hockey earns a penalty corner, usually Bodil Keus, Nike Lorenz or Linnea Gonzales takes over the circle. But in the Big Ten semifinals on Friday, another player got the call. In the 45th minute against Ohio State, freshman Taylor Mason took the initial pass from forward Bibi Donraadt and fired a hard shot from the top of the circle toward the goal. Goalkeeper Aaliyah Hernandez lunged to save the ball, but Mason’s shot deflected off her blocker and into the top left of the net. Mason smiled from ear to ear, hugging her teammates amid shouts of “good job, Tay!” and “yeah, Tay!” after getting her first career goal as a Terp. Her score was Maryland’s eighth of the day as the team eased to the Big Ten championship with a 9-1 victory over the Buckeyes. No. 1-seed Maryland went on to win the conference championship on Sunday, defeating No. 6-seed Iowa 2-1. Throughout the weekend, Mason played a bigger role for the team than she has all season. Before this weekend, Mason saw action in nine games, averaging 17.7 minutes off the bench and notching one shot and one assist. But she was on the field for a season-high 46 minutes against the Buckeyes in the tournament semifinals, then played 18 minutes in a tight defensive matchup against the Hawkeyes in the final. At 5-foot-10, Mason is one of the tallest players on the team. Coach Missy Meharg said Maryland took advantage of Mason’s height against Iowa, as she used her long wingspan to press players and was able to quickly run up and down the field. Meharg said she’s also been impressed with Mason’s improvement and work ethic over the course of the season, leading to the increased playing time. "Every single training session, she's been getting better and better,” Meharg said. Mason credited her teammates — as well as the guidance of 31-year coach Meharg — in helping her transition into collegiate hockey after four years at Central Bucks High School West in Pennsylvania. She tries to soak in everything they say to better prepare herself for when she does get her minutes. WIth her time on the field increasing due to the impressive performance over the weekend, it’s likely Mason could play a bigger role for Maryland in the upcoming NCAA tournament, where the Terps enter as the No. 2 overall seed. And she’s ready to help her team win a national championship. The week long wait was ultimately worth it. 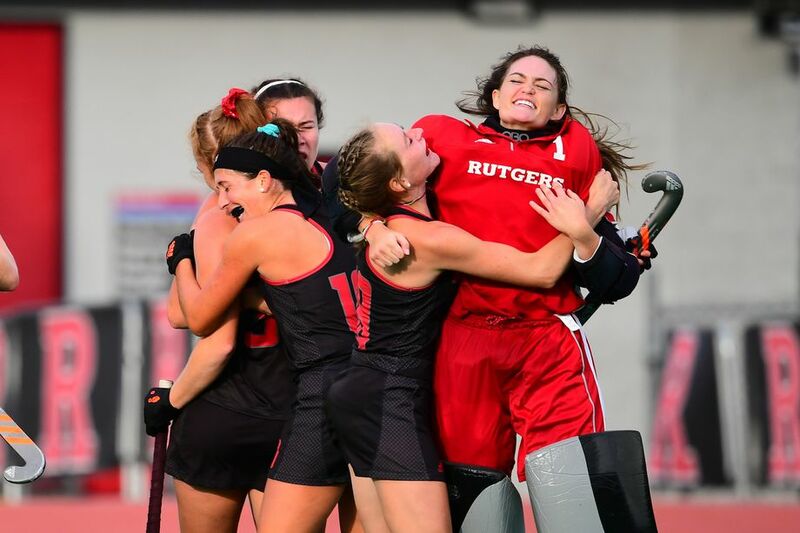 After producing one of the best seasons in program history, the Rutgers field hockey team earned its first NCAA Tournament bid in 32 years on Sunday night, when the 18 team field was announced. Rutgers will face the Big East champion and defending national champion UConn Huskies (18-3) this Friday at 2:30 p.m. in College Park, Maryland. The winner will face the winner of the First Round match between Albany (16-4) and Maryland (19-2). After finishing the season with a 13-5 record and five wins over ranked opponents, including two in the top ten, Rutgers earned one of eight at-large bids. The Big Ten earned four of those eight, as Penn State, Michigan, and Iowa joined Rutgers and conference tournament champion Maryland in the field. The Big Ten has more teams in the NCAA Tournament than any other conference. While coach Civico takes Rutgers to the NCAA Tournament for the first time in over three decades, she is no stranger to it. She played in three Final Fours as a player at Maryland, including being a key member of the 2005 national championship team. Playing this First Round match at Maryland brings things full circle for Civico, who has completely turned around the Rutgers program in her seven years at the helm. The Scarlet Knights went 3-3 against teams that made the NCAA Tournament, beating Iowa, Princeton, and St. Joseph’s, while losing to Michigan, Penn State, and Maryland. They tied for the lead in the nation with nine shutouts this season and had multiple players earn All-Big Ten season honors, including midfielder Daphne Groothuis and goalkeeper Gianna Glatz being named to the First Team. Rutgers is 2-2 all-time in NCAA Tournament history, winning both their First Round matches in 1984 & 1986, their only two appearances, before losing in the round of eight both times. Here is a snapshot of the side of the bracket that Rutgers is on. We will have a full preview of the First Round match against UConn on Thursday.